C IV emission line blueshift vs. C IV EW and quasar bolometric luminosity. 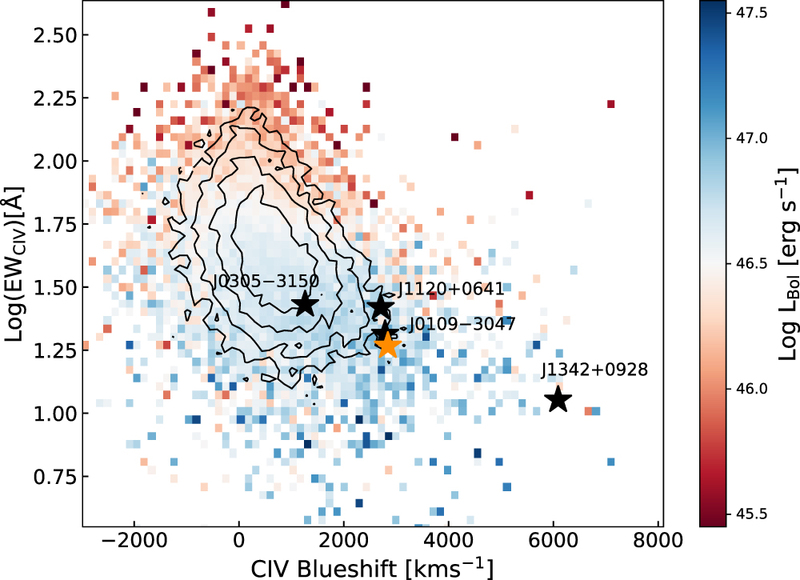 The contours and 2D histogram are for SDSS low-redshift quasars (Shen et al. 2011) and the black asterisks denote public known z ≳ 6.5 quasars with C IV observations (e.g., Mortlock et al. 2011; De Rosa et al. 2014; Mazzucchelli et al. 2017; Bañados et al. 2018). The orange asterisk represents J0038–1527. 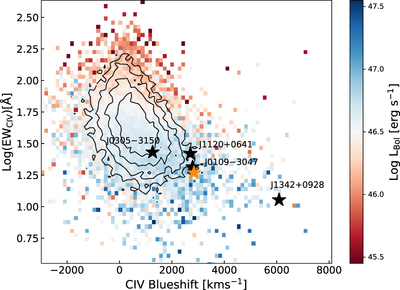 Although all z ≳ 6.5 quasars are in the large C IV blueshift tail, they are still consistent with the distribution of low-redshift quasars of similarly high luminosities.